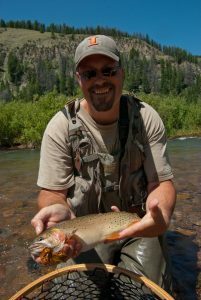 MY LOVE OF native cutthroat trout began when I moved from the Midwest to begin my Master’s Degree at the University of Wyoming in 1992. My graduate project allowed me to study the beautiful Colorado River cutthroat trout as well as see some amazing country throughout Wyoming. Weber River Bonneville cutthroat trout. It wasn’t long before I knew that I wouldn’t be heading back to the Midwest after I finished my education. While working in the Wyoming Range, I was mentored by the Pinedale Regional Fisheries Supervisor, Ron Remmick. Ron dedicated his career to native cutthroat trout conservation and his enthusiasm continued to fuel my love for cutthroat trout. We had many great conversations standing at the tailgate of his truck after a long day electrofishing and what Ron really wanted was to get the angling public more excited, educated and involved in native cutthroat trout conservation. So in 1996, about a year after I had begun working for the Utah Division of Wildlife Resources (UDWR), I was not surprised to hear that Ron Remmick and the Wyoming Game and Fish Department had initiated the first ever fish slam — the Wyoming Cutt Slam. 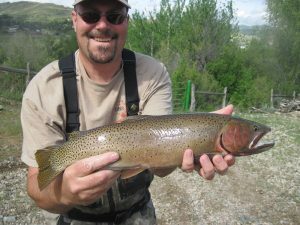 The Wyoming Cutthroat Slam is one of Ron’s greatest legacies for native cutthroat trout; it is unfortunate that cancer took him before he could fully understand its impact within Wyoming and ultimately the entire West. In the mid 1990s, as a young biologist working for the UDWR, I was still feeling my way along on how my career would ultimately progress. When a cutthroat trout biologist job opened in northern Utah, I put everything I had into getting that position. 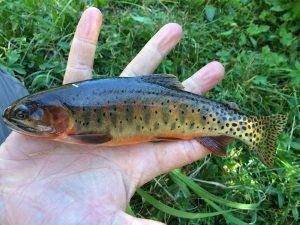 And it paid off — I landed my dream job working on native cutthroat trout as well as other native, largely unknown aquatic species in northern Utah. Paul’s Colorado River cutthroat trout. There are many streams in northern Utah, so I had my work cut out for me. At this point, the UDWR really didn’t have a good grasp on where native cutthroat trout occurred in my region so I spent several years surveying streams to find populations and document the extent of occupied habitat as well as threats to populations. I spent two months in 1999 surveying Chalk Creek (Bonneville cutthroat trout) and the Logan River (Bear River cutthroat trout) drainages and documenting cutthroat trout in over 100 miles and 60 miles between the two drainages. I also surveyed many of the drainages on the North Slope of the Uinta Mountains looking for and finding Colorado River cutthroat trout. In 2001, I researched our records for the Raft River Range, where we have native Yellowstone cutthroat trout (YCT). The UDWR hadn’t been out to this country to look for YCT in more than 20 years and our records didn’t paint a very good picture that Utah still had this subspecies of cutthroat trout. 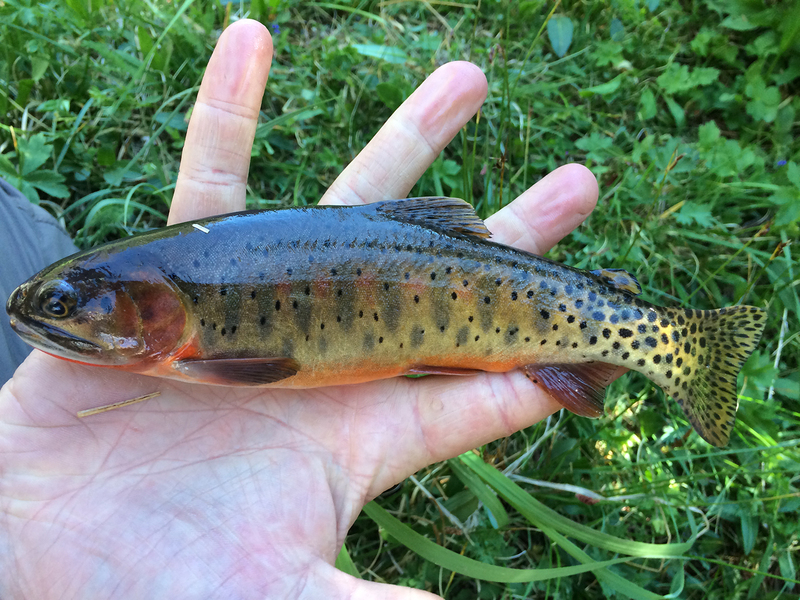 After a month of hiking and electrofishing, I discovered that Utah still had six drainages with YCT and further genetic analyses indicated that at least a portion of the fish in five of those drainages were pure YCT (e.g., not introgressed with rainbow trout or other cutthroat trout). About a decade of my career was dedicated to surveying and documenting where native cutthroat trout still persist in northern Utah. More recently, my office has shifted its focus to the protection of critical cutthroat trout populations, restoring populations where they have been lost, and reconnecting habitat to allow cutthroat trout to fulfill their life history needs. Bear River cutthroat trout — one of four trout you can catch to complete the Utah Cutthroat Slam. My love of cutthroat trout has definitely spilled over to my passion: fly fishing. These fish have taken me across the West and to date, I have angled Colorado River, Bonneville, Bear River, Yellowstone, Fine Spot, West Slope, Coastal, Greenback, Lahontan (and if you are a splitter, also Humboldt), Rio Grande, and Paiute cutthroat trout in their native ranges. Angling these beautiful fish and other native trout species has allowed me to appreciate the diversity of Western trout and the issues that other states are facing in their native trout conservation efforts. Ultimately, however, the greatest outcomes from these travels are the relationships that I have built with other biologists that share my same passion for native trout. Through my career, I have attempted to promote a native cutthroat trout slam within the UDWR a couple of times. Unfortunately, everyone is busy (including myself) and while there was interest in getting a slam going in Utah, we could never really get the momentum to initiate the program. I was extremely excited when Brett Prettyman recently joined forces with Trout Unlimited (TU) and had the same vision regarding a Utah Cutthroat Slam. Having TU as a partner generated enough momentum that the UDWR knew the time was right to work with TU and roll out the slam. The excitement that has been generated by the Utah Cutthroat Slam has exceeded my expectations! By early September, about 600 people had signed up for the slam and more than 70 had completed it. It’s been great to talk with anglers on where to catch the four cutthroat trout subspecies and it is even more rewarding when they follow up with me once they’ve completed the slam. For the most part, everyone has truly enjoyed completing the slam and they feel that the challenge makes the reward that much more enjoyable. 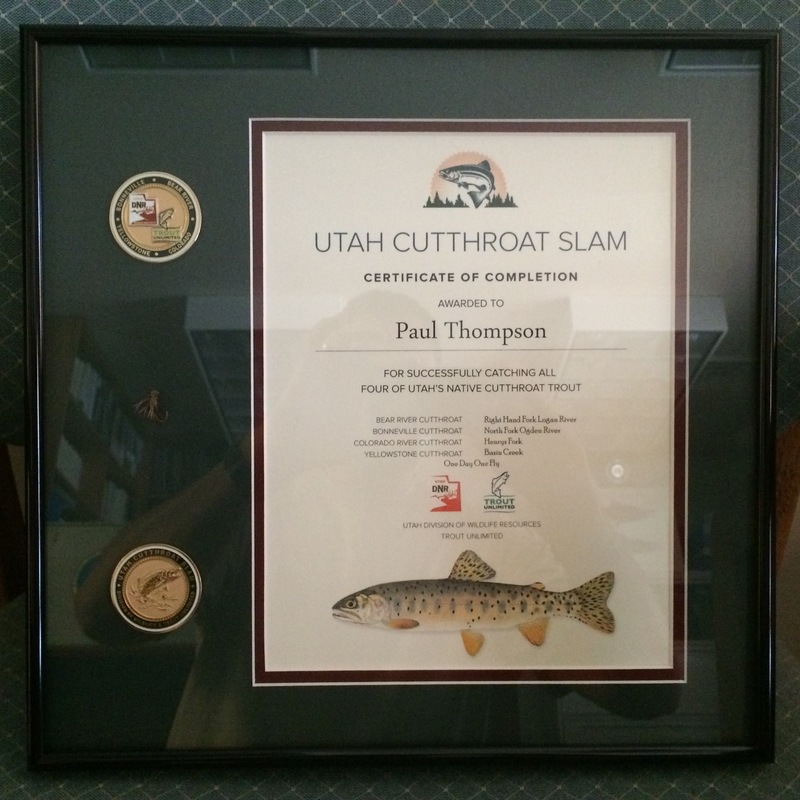 Paul Thompson completed the Utah Cutthroat Slam twice so he could display both sides of the medallion. One negative on the slam that we’ve heard is that it would be too hard to complete. The UDWR and TU have information available on where to catch these fish and UDWR biologists are available to discuss angling options. To help address the concern about the difficulty of the slam, two of my co-workers and I put a small video together where we completed the Utah Cutthroat Slam in a single day. While this might not be for everyone, it does highlight how achievable the slam is! I have personally completed the slam twice so far. I needed to get two completions so I could frame my certificate and display both sides of the medallion. I have the certificate framed and hanging in my office. 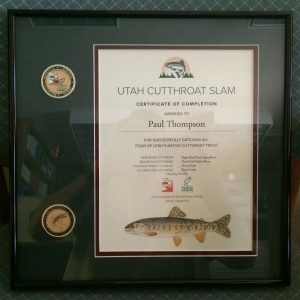 Every time I look at it, I smile and feel a great sense of accomplishment not only for completing the challenge, but for the excitement that the Utah Cutthroat Slam has generated toward native cutthroat trout in Utah. This brings me full circle back to Ron Remmick who I feel ultimately started the cutthroat trout excitement in the West. His contribution with initiating the Wyoming Cutthroat Slam was truly larger than he would ever realize. I’ll likely complete the Utah slam several more times in the future and I am already thinking of ways to further challenge myself or make a slam completion more meaningful. I think the next slam I complete will encompass cutthroat trout from streams that I have personally been involved in restoring or protecting for native cutthroat trout! Paul Thompson is UDWR's Northern Region Aquatics Program Manager. He coordinates all aquatics-related programs and projects in Northern Utah. Paul enjoys the diversity his job offers. He works on everything from native species, to sportfish.